The EU and Taiwan enjoy a dynamic economic and trade relationship. Specifically, in 2017 Taiwan became the EU’s 16th trading partner following an increase of goods by 9.8%. Furthermore, the EU is Taiwan’s 5th largest trading partner, after China, ASEAN, USA and Japan. The mutual benefits resulting from the Bilateral Investment Agreement (ΒΙΑ) and the insurmountable contribution of Taiwan to the economic growth of the EU were the main issues of the roundtable discussion organized by EBR and the Taipei Representative Office in Greece which was held at the European Parliament Information Office in Greece. It is an undeniable fact that in a multipolar world order the EU needs to form -and reinforce the current- strategic partnerships in order to confront a crucial agenda related to climate change, sustainable development and energy security, migration, violent extremism, governance and human rights, education, culture, conflicts and new forms of hybrid warfare. In times of rising economic nationalism and protectionism, both partners have the common interest in an open, free and fair rules-based international trading system as the best way to foster innovation, boost economic growth and increase the wellbeing of their peoples. 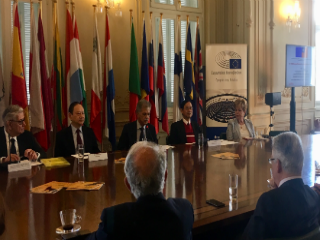 In his remarks, the Representative of Taiwan in Greece, Ambassador Sherman S. Kuo, stressed: «We are optimistic that both EU and Taiwan are trying hard to complete the preparatory phase before conducting an impact assessment and then start negotiation». On his part the Member of the Greek Parliament, Mr. Spyros Danellis, characterized Taiwan as «a miraculous country» of paramount strategic importance. «It has the world's 19th largest GDP based on its purchasing power and constitutes a technology leader with developmental research structures». «Despite the slow progress Taiwan has expressed its desire to start negotiations with the EU on a BIA to enhance bilateral relations via business and trade for many years», Ambassador Kuo explained. During his presentation regarding the latest economic figures and the current business climate, the Economic Director of the Representative Office of Taipei in Greece, Louis Huang, mentioned that the EU imported 13.1% more goods from Taiwan than during the previous year, with a total value of €29.5 bn, reaching a historic record -an impressive demonstration of the close economic ties between the two partners. 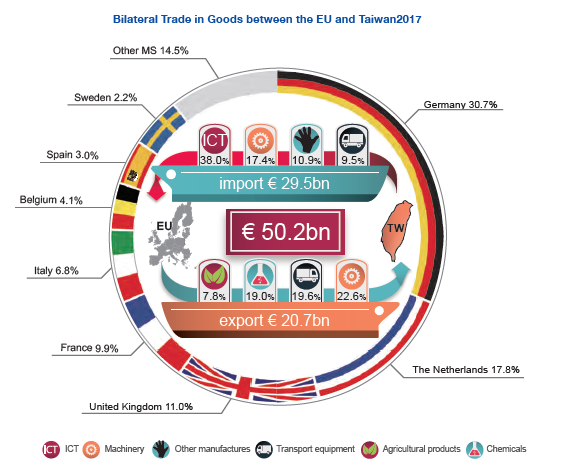 Among the 28 EU Member States, Germany accounts for the largest part of Taiwan’s trade with the EU (30.7% share or €15.4bn), followed by the Netherlands (17.8%, €8.9bn), United Kingdom (11.0%, €5.5bn), France (9.9%, €4.9bn), Italy (6.8%%, €3.4bn), Belgium (4.1%, €2.0bn) and Spain (3.0%%, €1.5bn) in 2017. These seven countries account together for over 80% of the bilateral trade between the EU and Taiwan. 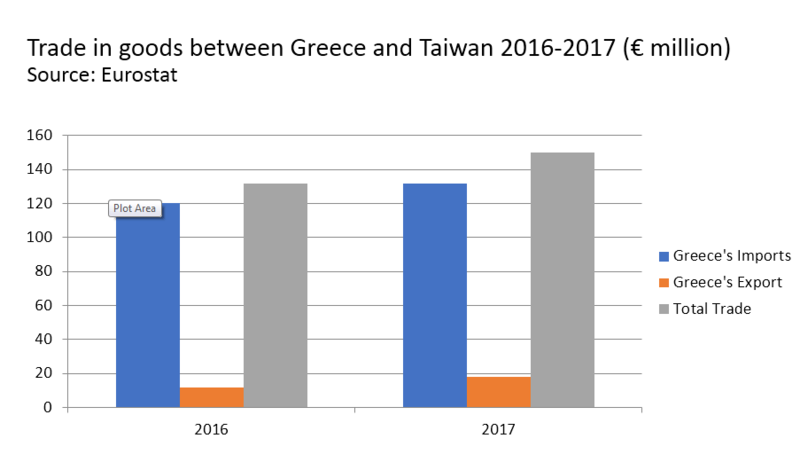 In 2017, Greece imports from Taiwan increased 9.9%, to 131.91 million, while exports to Taiwan increased 53.1%, to 17.95 million. Data from January to August, indicate that Greece exports to Taiwan increased 333.31%, to US$67.92 million. As far as the type of products is concerned, Taiwan has presented a strong demand for the EU’s semiconductor equipment, electronic integrated circuits, cars, pharmaceutical, aircrafts, and beverage, boosting imports by 5.4% in 2017. On the other hand, cooperation on chemical industry further boosted EU’s exports to Taiwan. The country also imports, amongst others, acyclic hydrocarbons and petroleum. Office and telecommunication equipment was Taiwan’s most important export commodity, accounting for more than a third of the EU’s imports (38.0% or €11.2bn). At the same time, the European FDI stock takes 28.7% of all inbound investment to Taiwan. Speaking at the event, the President of the International Chamber of Commerce (ICC-Hellas), Mr. Nikos Vernicos, emphasized on trading activity at a global level. «ICC is strictly criticizing USA's policy as we promote free-trade investments. It is important to mention Greece constitutes one of the most significant partners for Taiwan and I’m happy to see the increase of its economy». Over the last four years, the European Economic and Trade Office has organised with its Taiwanese partners more than 22 trade-related activities to strengthen the bilateral dialogue and to share experiences. Through these exchanges, both sides have increased their mutual understanding and opened the door to align further their respective regulations with global standards in order to facilitate their bilateral trade. In 2013 the European Parliament called on the European Commission to start talks for investment and trade agreements with Taiwan. The institutional body highlighted the relevance of the Asia Pacific Region for European economic interests in its new trade and investment strategy “Trade for All” published in October 2015. As part of its Asia strategy, the communication states that “the EU will explore launching negotiations on investment with […] Taiwan” to broaden its network of investment agreements in the region. The EU officially announced in September 2017 that it was preparing to launch negotiations on a Bilateral Investment Agreement with Taiwan. In May 2018 on the Annual report on the implementation of the Common Commercial Policy, the Commission has announced on more than one occasion the launch of negotiations about investment with Hong Kong and Taiwan and stressed the need to finish the preparatory work in order to formally start negotiations on investment agreements as soon as possible. In this context, the Professor of International Politics at Panteion University & Director at the Institute of International Relations, Dr. Harry Papasotiriou, focused predominantly on the geopolitical dimensions and the role of China in the region. «Taiwan is at the epicenter of one of the most important antagonists in the world. As a result, it is clearly observed a shift of the global balance of power», he noted. However, the country has managed to be emerged as a free-market based economy and multinational democracy. A Bilateral Investment Agreement between Taiwan and the EU will have important benefits for both parties, notably i) the promotion of the investment of small and medium-sized enterprises in the EU and in Taiwan, bringing about more job opportunities for the EU; ii) the establishment of free, transparent, and healthy market mechanism between the EU and Taiwan, which will help investors to better understand the markets of both sides; and iii) as the EU actively engages in signing agreements on economic cooperation with other Asian countries, the BIA between the EU and Taiwan will help the EU complete its strategy in Asia. «Without a doubt the West shares the same economic values and geopolitical orientations with Taiwan. Therefore, the two countries should remain geopolitically aligned», Professor Papasotiriou highlighted. «We hope that Greece will support the Taiwan-EU BIA and urge the EU to pass the political validation as soon as possible, thereby launching the public consultation and impact assessment», Mr. Huang commented. Fostering peace, security and stability, human rights and democracy, intercultural dialogue and addressing climate change and environmental challenges, energy efficiency, business and trade, market access, resilience building, and regional integration are thus key priorities for the EU in Asia, a region in which the EU and its Member States have substantial interests. «The sooner an agreement will be reached, the sooner the two partners will be benefited from growth and creation of new job positions. In any case, the EU shouldn’t apply double standards in its policies», Mr. Danellis concluded. *Journalist at European Business Review & Euractiv Greece. She holds a M.A degree (Hons) in Political Communication & M.A (Hons) in International Relations and Strategic Studies.